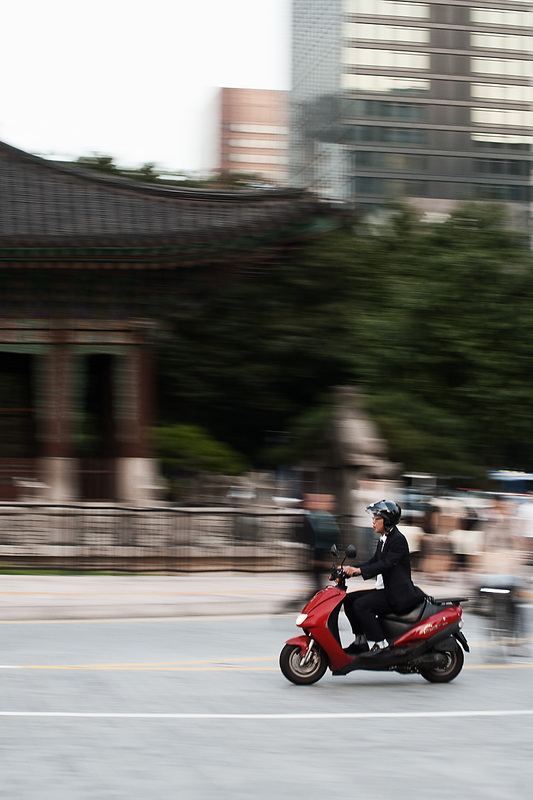 jonnyontheroad: South Korea: it's a 125cc, baby! South Korea: it's a 125cc, baby! Asian countries have been lauded in recent decades for their steadily rapid economic growth. For their prowess they earned the moniker "economic tigers," particularly the four economic powerhouses of Hong Kong, Singapore, South Korea, and Taiwan, with other southeast Asian countries recently dubbed "tiger cub economies". But tigers in Asia are severely endangered, with worldwide population estimates hovering around 3,500. Three of the nine original tiger subspecies have already become extinct. Perhaps we should choose a better mascot for these still-thriving economies than an animal which, like it or not, is on a seemingly irreversible decline. Perhaps we should consider an image still vibrant and visible throughout the continent, a representative of the asian worker's struggle, his pride in his work, her defiance of larger, looming economies that threatened to drive her off the road. Perhaps it's time we thought outside the box. I humbly propose: The Economic Scooter. Any pedestrian traveler attempting to navigate an Asian city for the first time is quickly frustrated and annoyed by the seemingly endless throng of motorbikes and scooters that clog motorways across the continent. Southeast Asia, where the motorbike doubles as a minivan for the entire family, is particularly notorious. Even in the developed Asian countries - the supposed "tigers" - the scooter hasn't lost its edge. Though consumers are buying cars in record numbers, the scooter market is still thriving. Businessman or delivery boy, no one is above a little scooter ride. 1. They are cheap. You can buy a brand-new scooter in Korea for 1,000 USD. I fill my gas tank once a week for 5 USD. 2. They are faster than cars. * Since scooters are often held to few, if any, traffic laws, they can go wherever, whenever they please. Go the wrong way down a one-way street? Cars will pull over. Run a red light? The cops will wave you past. Drive full-speed along a crowded sidewalk during market day? Pedestrians will move to the street. 3. They look more dangerous than they really are. I know how #2 sounds, but don't worry Mom! There's order amidst the chaos. After about a week of riding in traffic, you reach a moment of scooter zen, and your role becomes clear like water pouring into a stone-filled glass. 1. They are cheap. And by "they are" I mean "labor is." 2. They are faster than cars. Ok, that one doesn't make much sense. 3. In spite of - or because of - the frantic, heart-burning pace of the Asian Scooter economies, Asians are careful. They don't spend money just because they have a shiny plastic card that says they can - though they understand the danger (which is why, I suspect, it is illegal for Koreans to gamble in Korea). The memory of poverty is still fresh in their minds. I don't think most Asians want to belly up to an all-you-can-eat buffet with their American counterparts. They're generally happy with their bowl of rice and small helping of side dishes. 4. They are built on a foundation of collective values. You may discount this one as irrelevant, namby-pamby, or idealistic, but let me give you some advice: don't. The Korean word "jeong" [정] - variations of which exist in China and Japan - is difficult to translate, but loosely means "togetherness, love, sympathy, feeling," and just about any other feel-good word that makes you want to give someone a hug. Though much of Koreans' behavior and interaction is dictated by a seemingly draconian Confucian culture, Koreans also feel bound to each other through jeong - not as a burden, but as a blessing. This influences all manner of conduct, including business transactions, conversations, and how to behave in traffic. In my experience, road rage is a rarity throughout Asia. When I zip past a Korean sitting still at a red light, it seems - though I can't be sure - the driver simply thinks "he must have somewhere very important to be." this rings true for me in my observations of my younger teacher friends. the memory of poverty is their parents and it's getting pretty stale. what better way to feel "jeong" on a saturday afternoon than to go to the nearest shopping street and spend tons of won? it's interesting that for so long koreans collectively saved, and now they're collectively overspending. once the generation that is happy with the rice and kimchi dies, will koreans be collectively unsatisfied by anything less than TGI Fridays? my two cents. be careful with those ccs dude. yeah i hear you - i think that #3 applies more to the recent boomer countries, and the older south korean generation as well. keeping up with the joneses (or jongs) is the hip way to save face. most young koreans don't remember poverty and want to live like paris hilton. and though they are still living at home until they get married, well into their 30's, they don't use that as an excuse to save. the caution exercised by the scooter economies, which has helped them boom, is getting tossed out the window. We are seeing more and more scooters in US as well. One of the fastest growing markets for cycle dealers is scooters (while the markets for larger bikes have been flat or slowing). I wouldn't mind getting a scooter to navigate some of the commuting areas; I just don't want to trade in my larger bike to do so. Enjoyed the musing about the collective experience as well. Much harder to find in US except in cities with homogeneous culture neighborhoods. Loved the video of Vietnam scooter intersection! I have a collection of amusing bike photos on computer, quite a few of which are Asian overloaded scooters.